I have to admit, when I was contacted by Teddy’s Tack Trunk about reviewing a Leistner brush, I almost just flat out said no. Of all the things I’m super particular about, grooming equipment generally doesn’t rank high up on my list. But Peony is a big lover of the brand and convinced me to give it a try, so I emailed TTT back and told them that I would review it, giving them the usual warning about how if I didn’t like the brush I would say so in the review. Luckily they were confident enough to chance it, because – and I never thought I would ever in my life utter this sentence – THIS BRUSH IS REALLY REALLY NICE. I know, it sounds crazy, but stay with me here. I read up a little bit on the Leistner brand on TTT’s website… “100% pure goat and horse hair bristles and fine quality beech and pear wood bodies carefully processed from sustained, European forests. This guarantees the best cleaning results with gentle, skin-friendly care, as well as a high durability and longevity of their grooming brushes.“. Honestly, it was greek to me, but it all sounds fancy right? ‘European forests’… that’s prime unicorn territory. 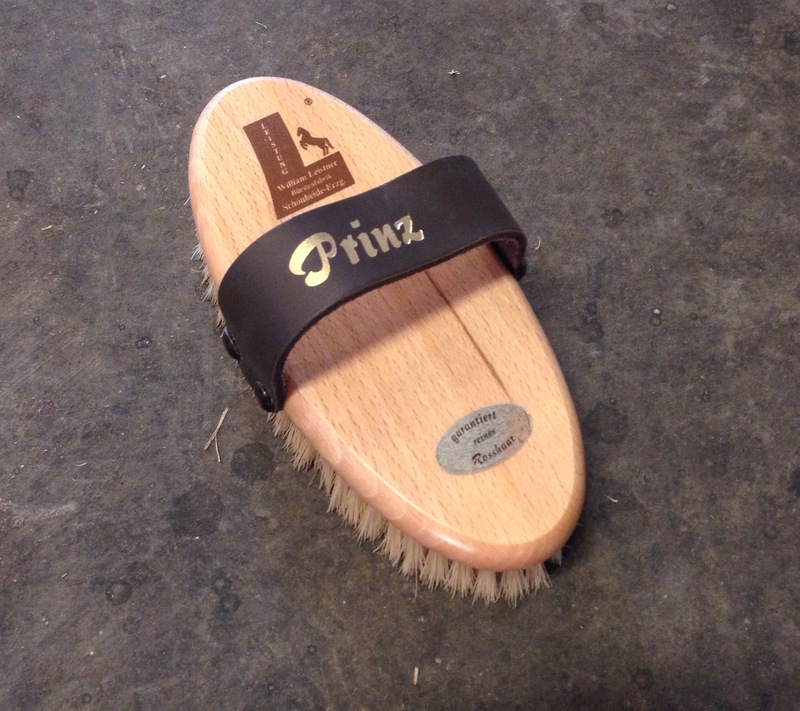 TTT sent me the Prinz brush, which is described as “a medium bristle texture, made of 100% pure horse hair and a lifted double edge of natural bristles”. Medium. Got it. When I first opened the box I could tell it was a nice brush… the wood is obviously nice quality, the handle is leather, the size is perfect, and the bristles felt amazing. If nothing else, it was pretty. No fake wood or plastic bristles here. I tugged on the bristles a bit to see if I could pull any of them out, but they all stayed put despite my attempted destruction. Then I used it. And used it more. And used it more. My other brushes mostly just move the dirt around, especially with Henry’s clipped and staticy winter coat, hence why I always finish up grooming by wiping him down with a microfiber rag. This brush actually pulled the dust out, visibly laid the hairs back down into place (someone gets major bed head when he sleeps in his pee), and left him super shiny. There is no need to follow up behind it with a rag. The outer bristles are a smidge longer than the inner bristles, so it almost works like a medium brush and a finishing brush combined. Thinking that this was some kind of magical voodoo, I went to a couple other horses in the barn with different coat lengths and textures and it worked just as well on them too. So here I am, yet again, having been proven wrong about a product. Is it possible for a brush to be amazing? I would have laughed at the idea before, but now I say yes. I’ve never even given so much as a second thought to my grooming tools (except my beloved Ultimate Hoof Pick, which someone will have to pry out of my cold dead hands) but the difference is undeniable. I thought Princess Henry might try to kick my face off with a medium brush but this one is quite soft and he didn’t seem to mind it. Henry not trying to kick my face off is basically the same thing as an official Henry seal of approval. I also noticed that this brush with it’s natural fibers seems to generate less static than my synthetic one does. Apparently natural bristles also help spread the oils of the skin a lot better too, which could be why I see a difference in shine. Price wise, the Leistner’s aren’t too expensive. At $19.50 retail, the Prinz is obviously more expensive than my $12.99 generic brush that I’ve been using, but the difference in quality is pretty obvious, and the performance isn’t even comparable. The Leistner Prinz wins that one by a long shot. There are a ton of different Leistner brushes on the TTT website, ranging anywhere from $9.50 to $32.50, plus some grooming sets. They’d be great presents… hint hint. This might be my first nice brush, but it won’t be my last. In the spirit of holiday sales, of which I am a seasoned sucker veteran, right now Teddy’s Tack Trunk has a special going on – $5 off orders of $50 or more (code HOLIDAY5) and $10 off orders of $100 or more (code MERRY10), with $2 flat rate shipping to the mainland US. If you think you can’t make it to $50 just buying brushes, they have EQyss, Espana Silk, Mrs Conn’s (psst the Mrs Conn’s sponges are buy one get one free), and several other product lines as well. Stock up, and as usual, support another great small business (with all natural products!) in the process. OMG. I need. My grooming-product-ho self is freaking out about that brush, and pretty much everything else on their website! I know right? Of all the products I’ve always been a ho about, brushes definitely were not one. Now I get it. I love good grooming stuff, that brush looks magical! One day I will replace all my brushes… one day. Can I have that one since it touched my face? No. I can just wash it really well and it’ll be good as new. Teddy is also a Haflinger so that makes everything from there twice as good. Well s&* t now I may need some new brushes I alway have used cheap but I have a mare that hates being groomed. Wonder if she would like these. I only used a soft brush and a rag on him before, and he doesn’t object to the Prinz. It’s quite soft for a medium brush. I do think it’s a good gift item. Like you, brushes aren’t generally something that I would buy for myself (at least not in the past) but I love it a lot. Very practical, but still really nice and will last a long time I think. I’m a brush ho. I’ll admit it. I have at least 3 full grooming sets. I hadn’t heard of the Leistner brushes before you mentioned them, but they look really nice and are reasonably priced too. I do like the Haas brushes, but my absolute favorite brush of all time is my Herm Sprenger horsehair body brush. It’s going on 10 years old, has brushed lots of horses and still looks very good. Good brushes are definitely an investment. I don’t remember what I paid for it (one of my hundreds of ebay purchases, but it was well worth the investment). Damn you Amanda! 🙂 I’ve been using the same brushes forever and I’ve never been 100% satisfied but couldn’t justify replacing them as they are all still serviceable. Now I MUST have ALL the brushes from this line! Merry Christmas to me! Blame Teddy’s Tack Trunk. She ruined me too. Welcome to the brush ho club! Once you’ve tried natural brushes there’s no turning back. I hadn’t heard of this line before. I may have to make some room in my grooming tote to give them a try. Hey, a $20 brush is cheap compared to most of the stuff I post about! 😉 Plus I give you discounts. That offsets everything, right? Seriously though Amanda you are ruining me!! I’m not a grooming ho either, but I might just turn a trick for one of those brushes. This. If you’re going to whore yourself out, at least do it for market rate. I want one… I’m pretending it means I too might not get my head kicked off. Ha! You got onto the Brush-Ho Wagon! You should see how many brushes I have in my grooming kit. Love my Leistners/Hass brushes…won’t touch another brush now.